On December 19, 2013, the Boston Zoning Commission approved a new zoning ordinance known as Article 89 that will support the growth of commercial farming in Boston. The ordinance supports farmers who want to pursue ground level farming, open air rooftop farming and greenhouse development. It moves Boston into the 21st century with other progressive cities like New York, Portland, Oregon, and Chicago, who are committed to the growth of this new industry. As urban agriculture gains momentum locally and around the world, landscape architects are poised to facilitate the planning and design of agricultural systems in complex urban environments. The question is, what will urban farming look like in Boston? CRJA’s Edward Adams’ thesis entitled “Growing East Boston” explores developing a framework for urban agriculture in East Boston. East Boston, like many other urban communities around the world, is dealing with critical issues including climate change, pollution, soil contamination, job security, and food accessibility. 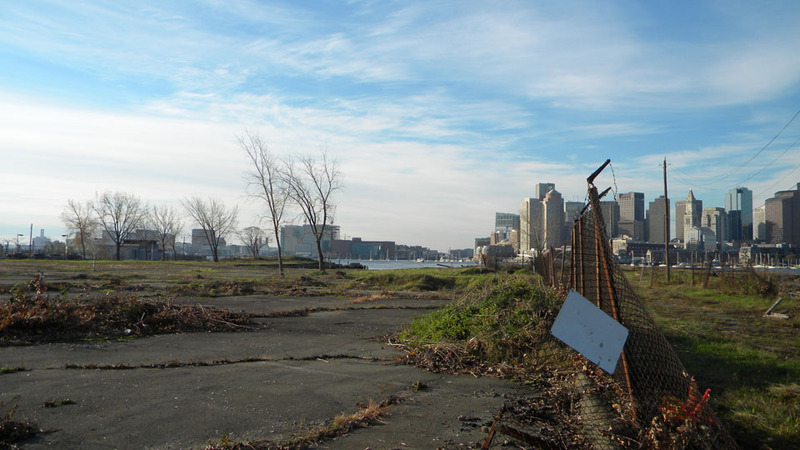 On East Boston’s waterfront, post-industrial lots lie vacant and inaccessible and serve as reminders of a period of industrial production. This project explores restoring production to the waterfront with sustainable urban agriculture as a catalyst for community growth. 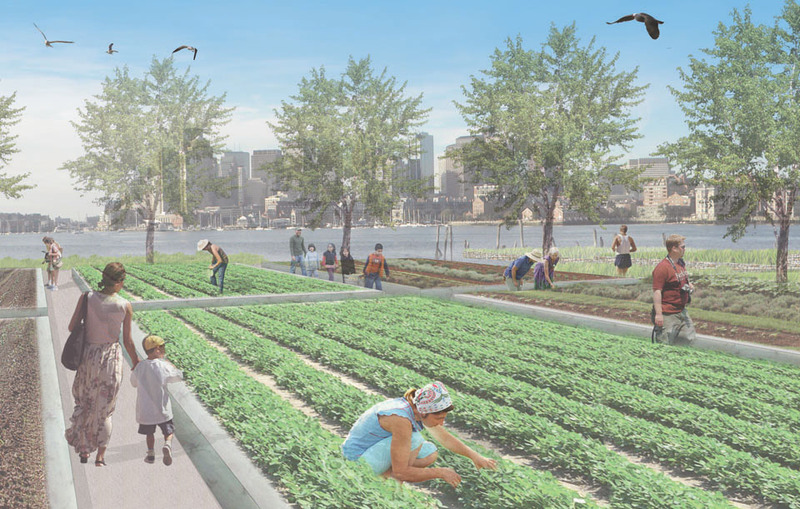 The project proposes to solve an impending food crisis while simultaneously rejuvenating East Boston’s waterfront by creating Boston’s first urban CSA farm. The design is based on implementing a flexible modular framework with the ability to change over time based on various levels of production. The framework is based on a productive module of 40’x80’ overlaid over the existing conditions and history of the site. The 40’x80’ module has the capability of reducing 25 tons of CO2 emissions annually, providing fresh produce to 20 people annually and providing housing for more than 20 people. 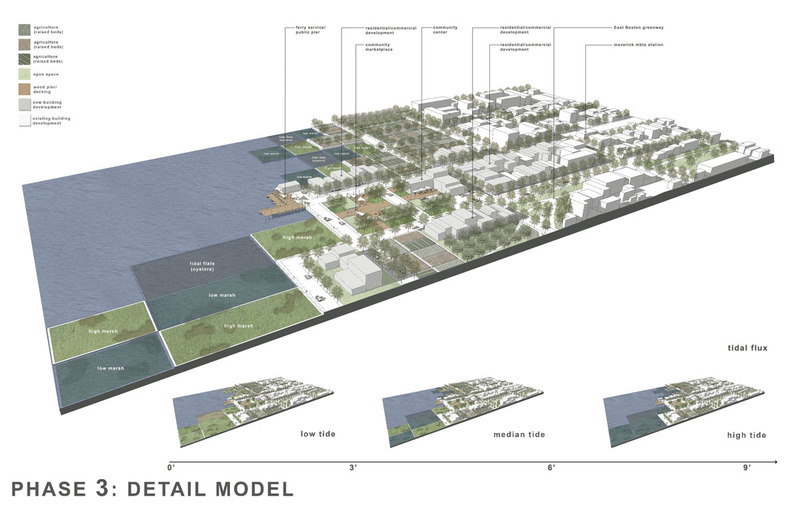 The module serves as a benchmark for tracking productivity and establishing a new form of development on the waterfront. 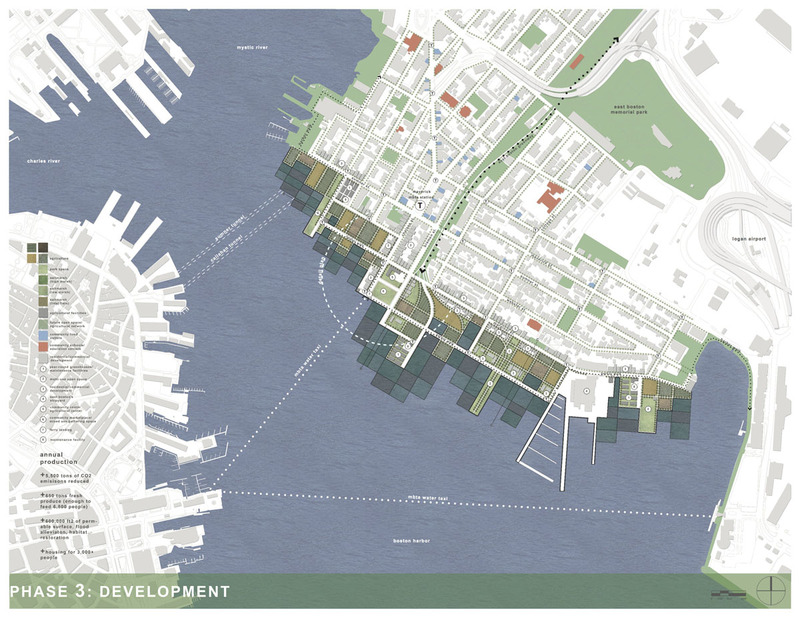 Inspired by East Boston’s historic street grid and piers, the grid framework maintains order between nature and manmade systems, establishing a new sustainable infrastructure. It provides the framework for a series of phases to remediate the site, implement urban agriculture, set the stage for development, and adapt to future issues like climate change. Phase 1: Remediation addresses post-industrial contamination on site and in Boston Harbor by restoring historic salt marsh, using phytoremediation to cleanse contaminated soil, and in-situ remediation to address the most contaminated areas. 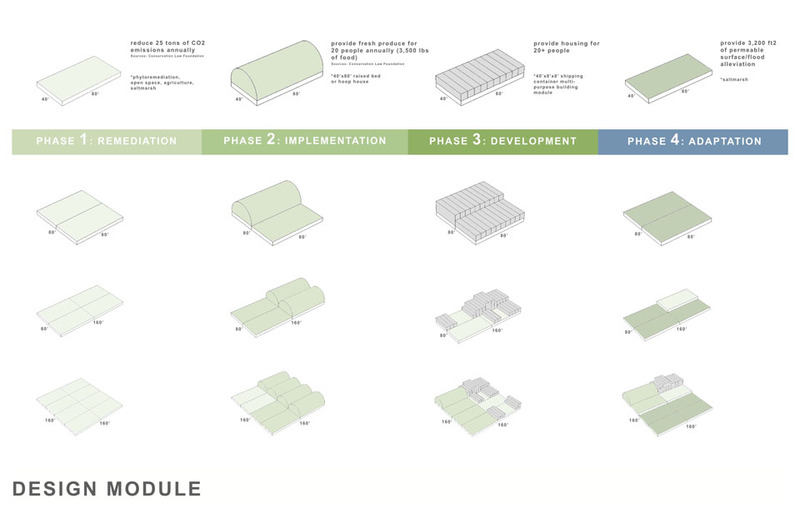 Phase 2: Implementation is the process of implementing agriculture on site once most contamination has been remediated. Agriculture will consist of raised planters, year round greenhouses, and aquaculture dispersed on site according to previous contamination levels. Phase 3: Development will set the stage for sustainable development to move into the site once agriculture has matured and the site has been completely remediated. Development will take the form of modular shipping, container housing, and commercial spaces in the form of restaurants, small businesses, and food outlets taking advantage of harvests on site. 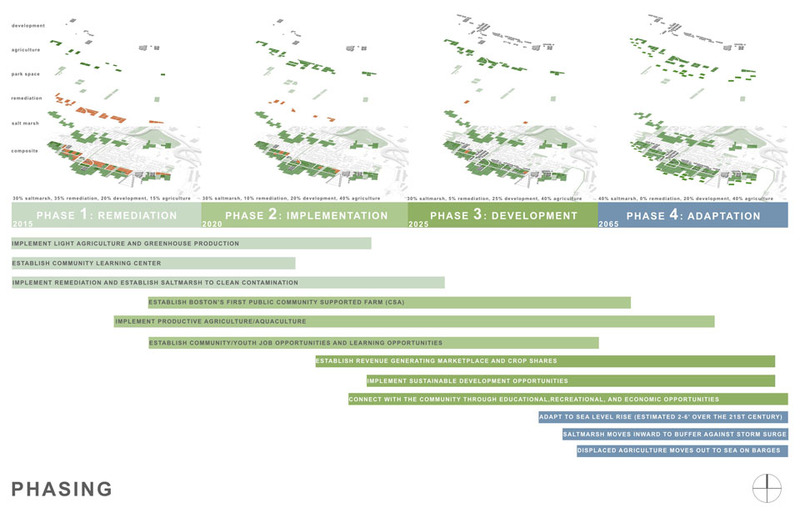 Phase 4: Adaptation will address the issue of sea level rise over the 21st century. Sea level rise is expected to be anywhere between 2’-5’ over the next 100 years. In order to protect against extreme high tides and storm surges, the site’s flexible modular framework will adapt to changing sea levels by incorporating more salt marsh and moving agriculture out to sea on new floating platforms/barges. Further exploration of Phase 3 focuses on the community agriculture center/marketplace, which is the focal point of the master plan. The new center will be located at the intersection of the Maverick MBTA station, the East Boston Greenway, the Boston Harborwalk, and proposed water taxis between Downtown and East Boston. The community center links to an outdoor marketplace/mixed use park, serving primarily as an outdoor farmers’ market and food truck venue for residents and visitors. At this junction will be located modular shipping containers, residential and commercial development, neighbors’ raised planting beds, hoop houses, and the salt marsh. Productive ecology mixes with modular development, stimulating revived activity on the waterfront along with economic growth. The center’s focus will be on educational, volunteer, and employment opportunities, while the outdoor marketplace will host farmers’ markets throughout the week. 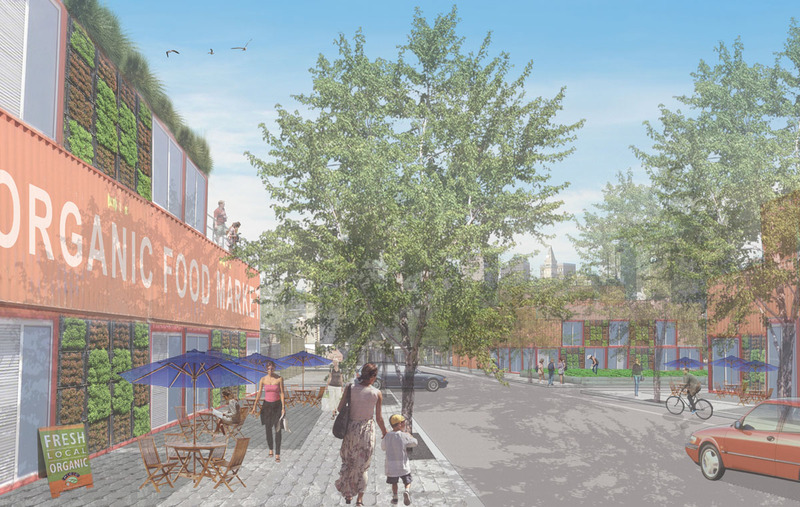 The overall design not only solves the impending food problem in East Boston but addresses soil contamination, environmental degradation, sea level rise, and accessibility. 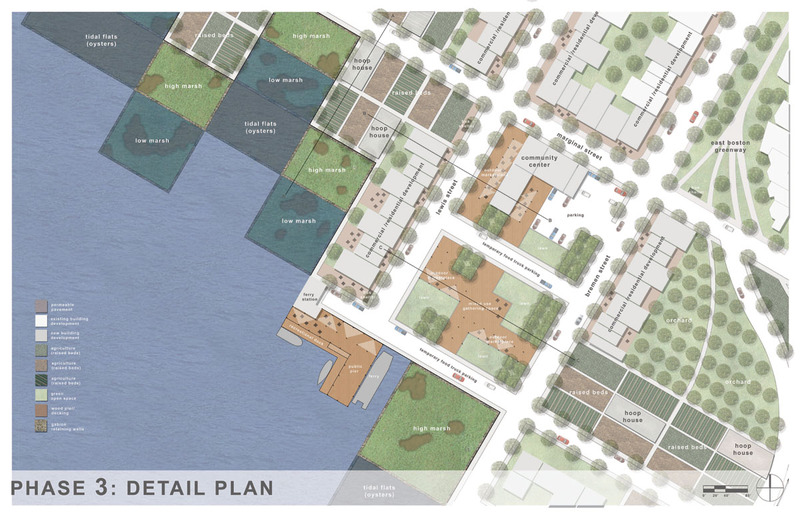 The flexibility, light development, and modular framework of the site will allow for future adaptation and the growth of urban agriculture will help revitalize and sustain the community.